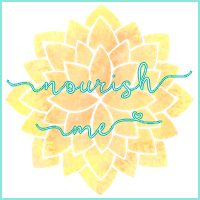 Nourish ME: June Favourites, A Life Update and VIDEO! June was possibly the most exciting month of my 2016 so far? Who knows. Anyway, SO much went on in the past month that it has honestly been a whirlwind. 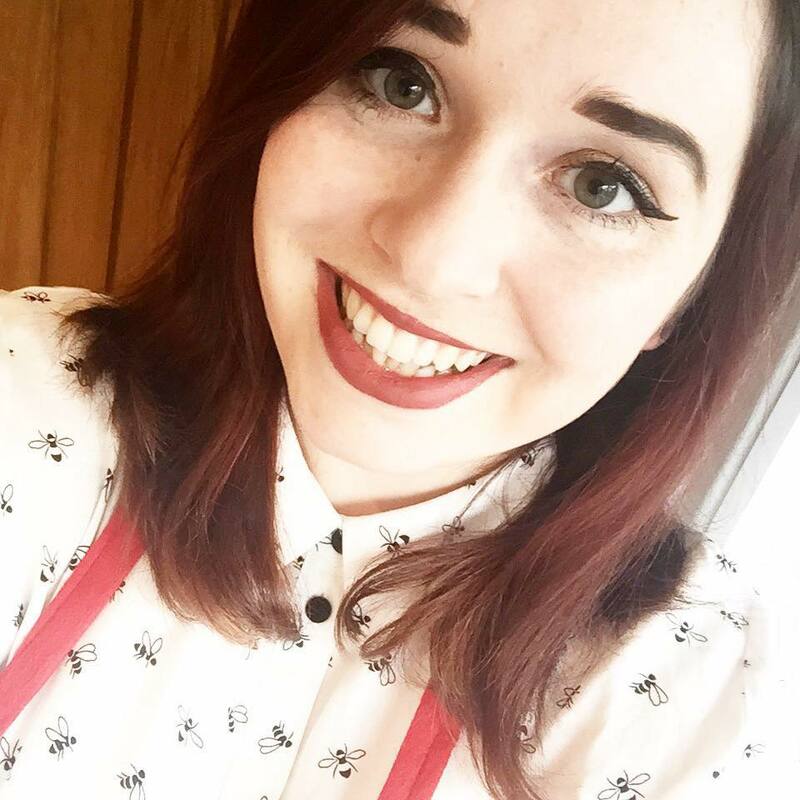 I finally landed my first big freelance writing gig, which I'll be finishing off in the next week or two and I've been working around the clock to organise this! Away from the work front, I turned 22 at the beginning of the month, which meant I finally got to move away from the spending ban I've been ranting at you guys about for the past few months, even if it was only a couple of days' release. I got to see both my parents, my sister and even a cousin and uncle, so there were a whole tonne of festivities going on. Me and my boyfriend even hosted a barbecue, with reasonable success - the sausages weren't even blackened! I also got to move out of my student house for the last time, which honestly could not have come sooner. I don't know why student housing landlords all seem to be genuinely horrible, have no regard for their tenants, and charge extortionate prices for their disgusting homes, but y'know, freedom tastes wonderful now. At the moment me and my boyfriend have moved into a small building off of his parents' house with the hamsters and Ted the bunny until we both get stable incomes sorted so we can rent a flat together. Seriously though, all of this in one month has has me swept off my feet half the time, and I'm hoping that July is a little more quiet so that I have more time to focus on my freelance work and blogging. I've really been trying to up my skincare in the last month as we move into summer. I had been super lax with using moisturiser, and picked up a tub of The Body Shop's pinita colada body butter in an effort to combat this. This is part of a new range they brought out earlier this year and I can honestly say that I fell in love with this scent. It's definitely become my staple summer scent of 2016, and I can't wait to get my hands on some more of the range to see if they live up to this. I picked up the mini version of this and I'm honestly so gutted to have run out. Paired with this, I've been using LUSH's Rose Jam shower gel. I don't know what it is about this combo, but my skin feels amazingly soft, and I smell fab (if I do say so myself *wink emoji*). I've read so many posts about blogger's facial skin care regimes in the past few months that I've been itching to improve mine. But, well, the spending ban said no. So, I finally jumped on the Garnier Micellar Water bandwagon and fell a teensy bit in love. I've been using this after my LUSH 9-5 cleanser to remove any extra bits of makeup that didn't come off with my initial cleanse. 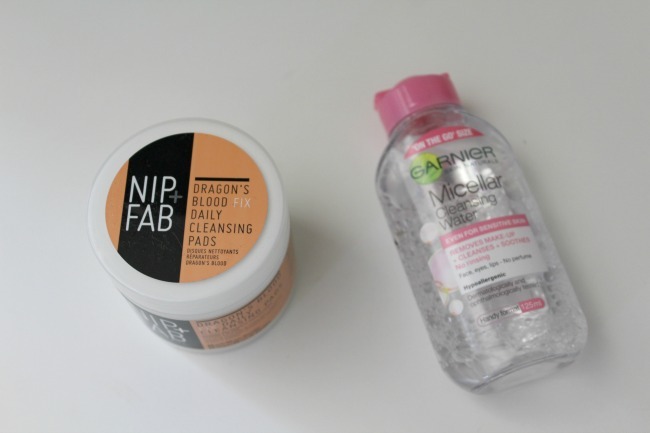 I've also been following it up with Nip + Fab's Dragon's Blood Fix Pads. 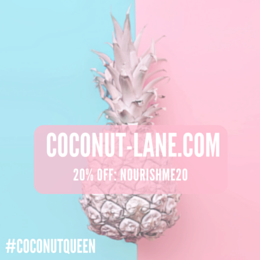 I'm not going to say too much about this combo now, because I'm saving it for another post, but let's just say that if you need a hydrating evening fix, I've got your back. 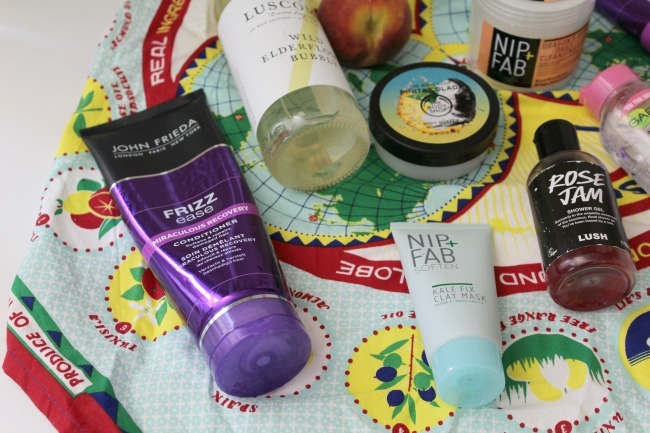 Nip + Fab really have done it for me again this month with their Kale Fix Clay Mask. This is another one I'll be talking about in more detail in the future. Although it's a clay mask, it is actually designed to hydrate dry/dull skin, and it really hasn't made my skin feel tight after using it at all! One thing I haven't really mentioned that I did in June is that I stripped the ends of my hair for the fifth time (why is it so dark, argh?!). It's now fairly blonde at the ends, and a dark red at the top (it doesn't look as bad as it sounds, I promise!). As a result of this, my hair has been a bit drier than normal, and in need of a slightly more intensive care routine. So, I've cut down on my hairdryer usage even more than usual, to just a couple of times a month. 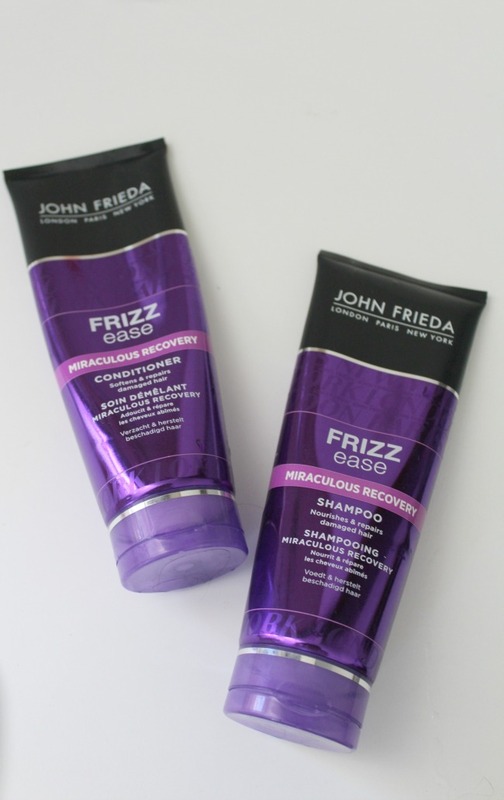 I also switched shampoos to give the John Frieda Frizz ease Miraculous Recovery shampoo and conditioner a go. These are doing wonders at keeping my hair nourished and hydrated, and I think they'll definitely have to be repurchased when *weep* they run out. 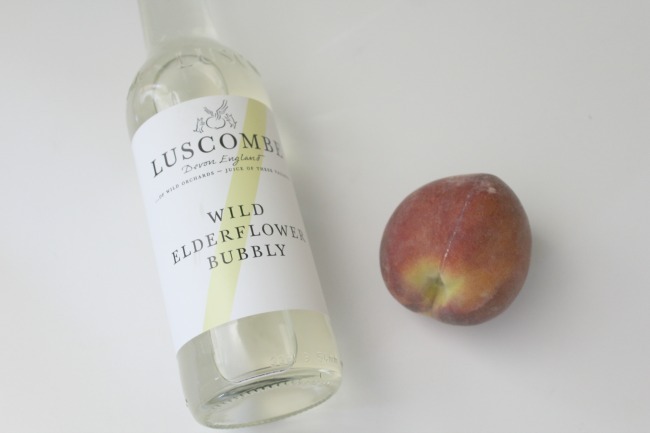 Finally we have Luscombe Drinks' Wild Elderflower Bubbly*. I first got to sample their drinks at the Bloggers Ball, and fell a little in love. Their PR team were kind enough to send me over a couple to try and oh my word this elderflower one truly hit the spot. paired with an ice cube or two, this is going to be my drink of the summer for sure. the garnier micellar water has been my fave for such a long time. also, lush rose jam is just the best. happy belated birthday lovely. 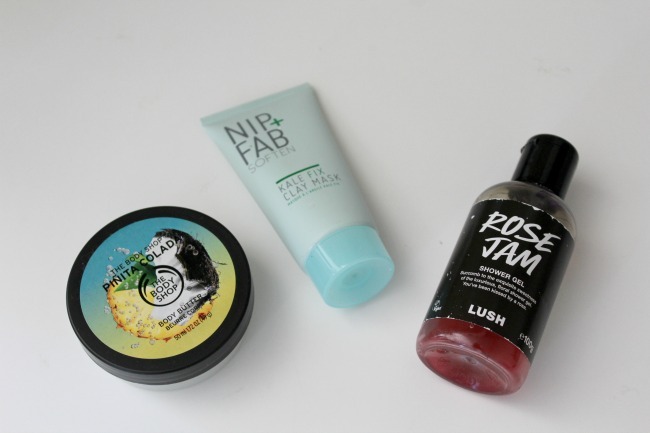 I'm so sad to have finished the LUSH rose jam shower gel - it smells too good! Thank you! Thank you! I can't believe it took me so long to try! 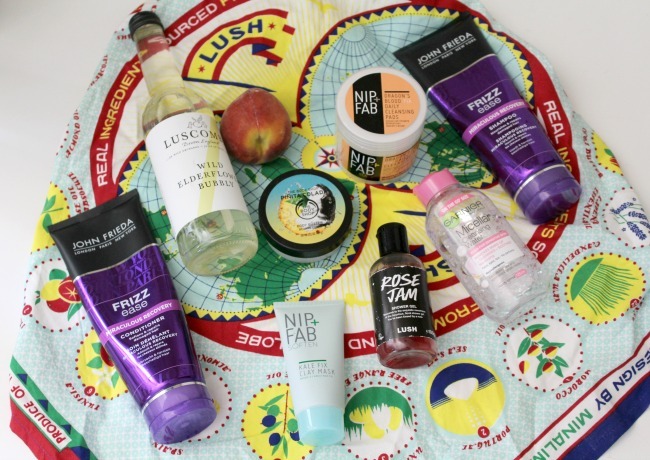 I love the Nip and Fab wipes and also the micellar water! Garnier Micellar is the best for sure for along time! I really want to start trying a whole range of micellar waters now to see how they compare!